Across food politics media the debate rages: organic or local? On the one hand, organic foods contain no pesticides, antibiotics, chemical by-products, or risky genetic modifications. On the other, local foods don't pollute the environment or contribute to global climate change traveling hundreds of miles from farm to table; they support local farmers; and retain much more of their nutrient value by not languishing for days or weeks in trucks and storehouses. Both organic and local foods benefit the environment; both benefit human health. Which should be the priority - when you're standing in the produce aisle at Whole Foods, should you buy the organic artichokes from Brazil, or the conventional ones from a farm less than a hundred miles away? The answer, increasingly, is that you don't have to choose, due to the rising popularity of Community Supported Agriculture, or CSA (no, not the Confederate States of America). Shares in a CSA can usually be purchased and/or exchanged for volunteer time assisting with farm work or distribution. CSA farmers are local and typically provide a weekly delivery or pick-up of a share of vegetables, fruits, and perhaps other farmed items like milk, yogurt, eggs, cheese, etc. Farms that provide CSAs are small-scale, often organic, and frequently utilize environmentally sound methods of production - resulting in both a healthier consumer and a healthier planet. This is my second year participating in the Washington Square CSA, provided by Norwich Meadows Farm in upstate New York. (At right: Zaid, our farmer.) The CSA runs from mid-July to November and provides 7-12 lbs. of organic, seasonal veggies weekly for around $10/week. For additional cost, shares of fruit, milk, eggs, yogurt, cheese, and even chicken can be purchased. In fact, seasoned veterans of Pie in the Sky may remember one of my first posts, which accounted for the varied uses of whole chickens that had accrued in the freezer over the course of the CSA (the chickens were fantastic, but we couldn't manage to eat one bi-weekly and I've got limited freezer space, so we won't be doing chicken this year). Anyway, this year I'm splitting my share with J and new roomie W, and we've signed on for veggies, cheese, yogurt, and eggs. I've had the (amazing delicious perfect creamline) yogurt and the cheese before, but this is my first time with eggs, which are organic and free range and have fiery orange yolks - the result of healthy chicken diets full of vitamins. 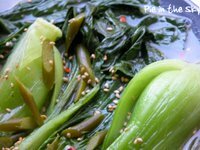 We got our first share on Wednesday (we walk a few blocks to pick it up) and have already made use of its bounty with omelettes, a fantastic salad, and this delicious Braised Bok Choy with Garlic Scapes. Before I tell you more about this recipe: what is a garlic scape? 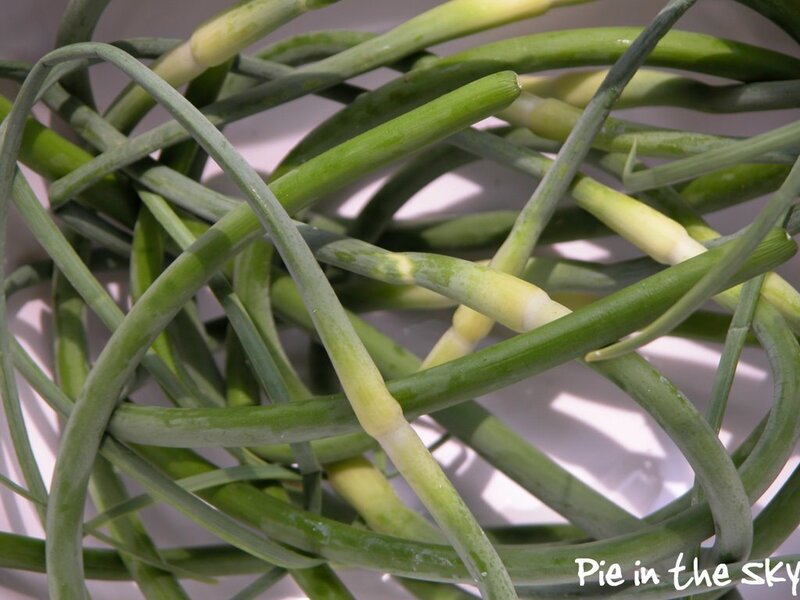 A scape is the tender stem of certain varieties of garlic that curls up and bears a pretty little seed-like bud. They're garlicky-tasting, but more subtle and buttery than garlic, and are usually sautéed, put in pesto, or eaten raw in salads, but can also be steamed, pickled, etc. A seasonal delicacy, their harvest time is brief but well worth it! As with any CSA item, taking a fresh, crisp head of bok choy (Chinese cabbage) - harvested only hours before - and cooking it to death would be ludicrous. This quick braise retains the crispness while infusing the leaves with buttery garlic flavor. The result: deliciously crunchy, flavorful bok choy, served in a fragrant broth. Melt butter in large sauté pan over medium heat. Add scapes and stir-fry to soften, about 1 minute. Add stock and bring to a simmer. 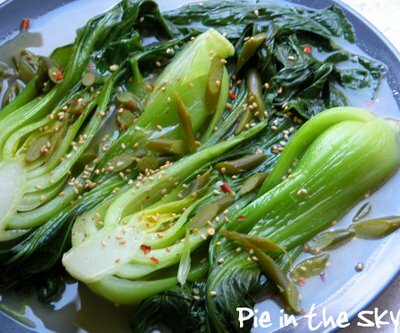 Arrange bok choy in pan and cover, simmering for about five minutes or until tender. Transfer bok choy to serving dish and cover to keep warm. Bring remaining broth and scapes to a boil and reduce to 1/2 cup or less. Stir in sesame oil and pepper; salt to taste. Pour over bok choy and sprinkle with sesame seeds; serve hot. Wow, Kate - as always, packed with great information! How I miss CSAs (we had some troubles last year with ours, that were unique to the particular CSA we were dealing with), but I did it for the last 4 years and I would love to do it this year again with a new farm. I can't wait to see everything that summer brings you and the magic you create from it! I have seen bunches of garlic scapes (or shoots) on my late visit to korean Town grocery. I wondered what they were for but didn't venture forward and bought them. 1) I heart your blog. I have had 3 meals of scapes (from my garden!) since Sat., sauteed in olive oil with chopped red spring onions, finished off in cream and poured over pasta (with a shake - or 2 or 3 or 4 - of freshly grated parmesan). They are so tasty and the extra glob of butter on top didn't hurt either. But that is after 10 hours of work and only 1/2 of an egg sandwich for breakfast. michelle - thanks! i hope you find a csa that works for you...it really has changed my life! 2) indeed, they are. mmmm. i wonder if german eggs taste different. linda - i'm so jealous that you grow scapes! your pasta sounds fantastic. guessi need to find some work to do to merit making it! Thanks for visiting me. You've got a lovely blog and absolutely beautiful pictures. I think there's a scape theme going on...they seem to be popping up in a few blogs lately :) I like what you've done with them. What an informative post, Kate! Good for you. I can't wait to hear more about your participation with your CSA.